There are some dishes which make you slog in the kitchen for hours and at the end of it, if the dish turns out good and the family likes it, you get a huge satisfaction. And then, there are some dishes that can be put together in the wink of an eye and again the family loves it and yes, you also get the same satisfaction. If someone asks me, which one of the dishes would I prefer to make, I would say, both, it depends upon the mood on that day. Ok, now, why am I beating around the bush, I just want to say, that today's post, Dadpe Pohe, is an easy dish and that it needs just a few minutes to put together but at the end, it's very tasty and satisfying. 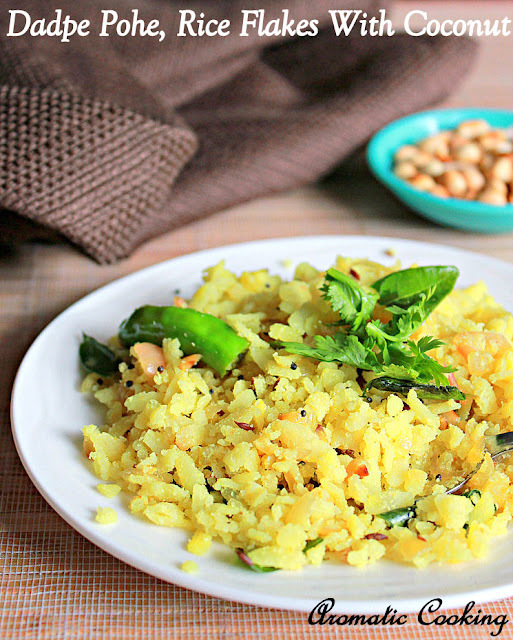 It's a Mahrashtrian dish and though the ingredients added to the aval/poha is the same as that we add to the Aval Upma, the way that it's added gives this dish a very different taste and makes it perfect for breakfast or an evening after school snack.. I got organic rice flakes which are thin but are not super thin, so I quickly washed and drained the poha and kept. Grind the coconut with 1 tablespoon of water and keep. Heat some oil, add the cumin seeds and mustard seeds, when it starts sputtering, add the asafoetida, green chilly, curry leaves and onions and saute till the onions turn translucent. Then reduce the heat completely, add the turmeric powder and salt, mix and remove. Add the onion mixture to the poha, then add the coconut paste, lemon juice and mix everything together with your hand and finally garnish with the coriander leaves and serve with the peanuts. If you get the very thin variety of poha and if your sure that it's clean, then skip washing it. Add everything in the same way, mix well and then place heavy dish over the poha, putting some pressure, so that the poha absorbs the moisture from the coconut paste and leave it like that for at least 15 minutes. Also in that case, you might need double the amount or more of the coconut paste. Do the washing and draining the poha, as fast as you can. Simple yet awesome side dish! 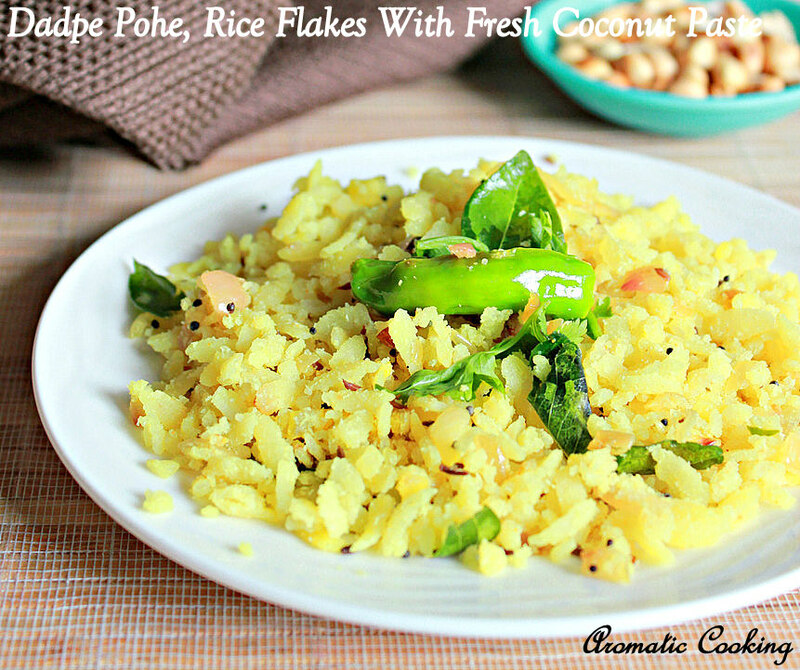 Dadpe pohe looks so delicious, Hema. Perfect breakfast for these cold days.